Up to 40% Off Men's Spring Suiting & More! 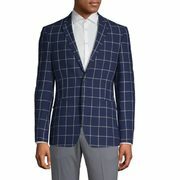 The Bay TheBay.com Flash Sale: Take Up to 40% Off Men's Spring Suiting, Dress Shirts, Ties & Shoes! Up to 40% Off Men's Spring Suiting & More! Get your wardrobe ready for spring with help from today's Flash Sale at Hudson's Bay, because they're taking up to 40% off men's spring suiting and more through the end of the day! No promo codes are required to shop this online offer, as all discounts are displayed on product pages. If you need a few ideas to help get you started, check out some of our favourites below. This offer is available exclusively online today only, March 26. Online orders over $99.00 ship free, however larger orders may require additional delivery fees. Alternatively, you can opt to pick up your online order at your nearest store (where items are available), no minimum required.